Our team have been working in the stone industry for many years. Collectively holding nearly 200 years of experience! Our continual reinvestment policy provides us with the latest state of the art machinery and technologies. This machinery allows us to keep turn around times to a minimum whilst maintaining our high standard of finish. No matter how big, or how small, every individual piece of work surface that passes through our production facility is finished by hand. This ensures that our experienced stone masons can put the perfect finishing touch to your surface. With almost 200 years of collective experience between them, our stone masons fully understand and achieve the highest possible standards for which we are renowned. Working closely with other masons, they work diligently as a team to ensure that any imperfections are addressed. The hand finishing work carried out on your surfaces, achieves a result that is superior to any machine finish. A final quality inspection ensures that your bespoke stone surfaces are ready for installation in your home. How long do the stone masons spend working on my worktop? There are many factors we have to take into consideration when looking at time spent on your surface. As a rule, our masons can spend anywhere from a few hours to multiple days working on your surface. What benefit does this have to me? The addition of our latest machinery offers amazing results on the surfaces. However, there are standards that need to be achieved when we deliver a product to our customers; and even latest technological machinery will need the final inspection and finishing of an experienced craftsman to achieve these levels. We ensure that every imperfection (non-natural) is perfected and every corner is rounded. No sharpness, no imperfections. Can I See How You Cut The Stone? All of our customers are given a full tour of our Production Facilities. You will see each stage of the fabrication process from the inspection of the slab right through to the the final work being carried out by hand. Can I Choose My Own Slab? 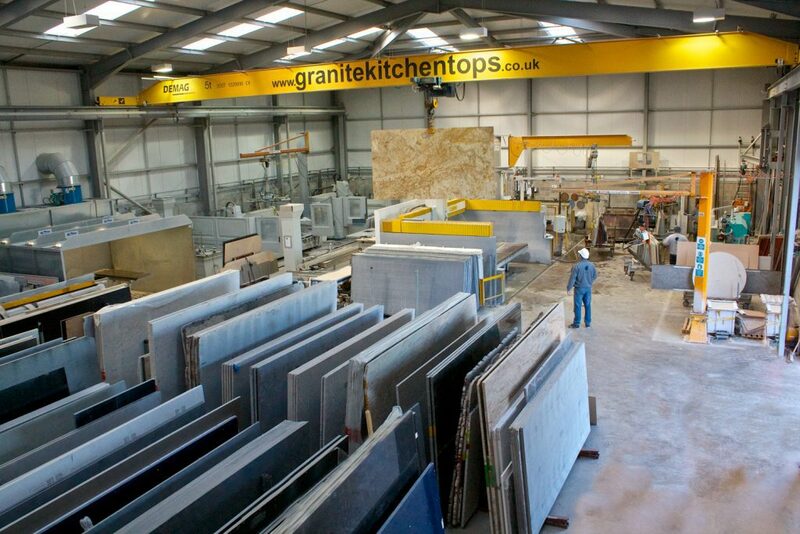 We positively encourage all customers to spend time with us, viewing and selecting the actual slabs that will be used on their own kitchen. Can I Select Which Part Of The Slab Is Used? On a material with movement, we give all customers the opportunity to revisit us after templates have been taken. Together we will then lay out the templates of your kitchen on your chosen slabs. 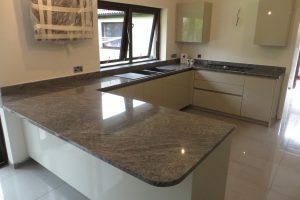 This give you the opportunity to have the final say in positioning you favourite area of the material exactly where you would prefer to see them in your finished bespoke kitchen. I didn't understand how much work went into producing these tops until we were given a tour of the production facility. Wow - walking round the factory and seeing the different stages of fabrication really opened up our eyes to the time invested into our surfaces. Now the kitchen is complete, we can see why Cardiff Marble pride them selves on their reputation. Thank you to all! Our Production Facility was purpose built by us for us. Over an acre installed with the latest technology, machinery and tooling. You will witness every stage of the fabrication process from viewing the slabs, inspection, fabrication right through to quality control. You will gain a full understanding of how your surfaces are fabricated, where they come from and how they will last you a life-time! Contact us today and bring along your kitchen plans. Use our online form and we'll get back to you as soon as we can.